My computer has returned, and with them my images — but there are still some loose ends that prevent me from posting my own photograph today. 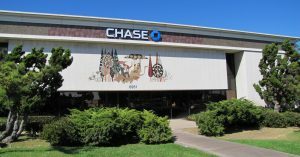 However, I was pleased to be contacted by M. Danko, who has begun producing lovely photographs of the Home Savings bank art at http://socal-bank-art.blogspot.com/. As I mentioned earlier, I was in Westminster for a planning meeting linked to my other Southern California avocation, the Past Tense seminar at the Huntington Library. 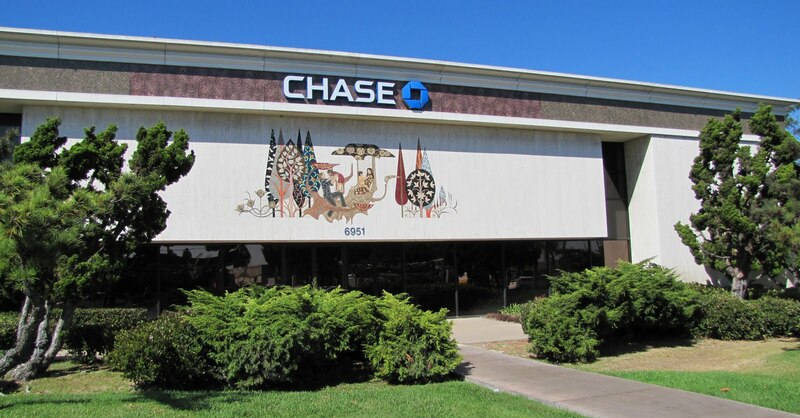 Getting off the freeway, I saw this bank, and then had to maneuver a collection of one-way streets, frontage-ways, alleys, and parking lots to get back to where I could see the bank. 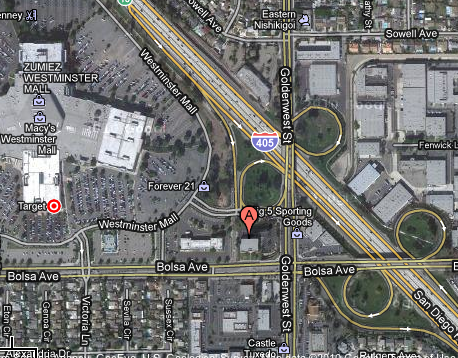 From another of the SoCal-Bank-Art images, here, you can see that the bank is set back on the lot, its parking behind; what this Google Maps aerial shot reveals is that behind that is the 405 freeway and the Westminster Mall. This is a hard bank to get to, I realized, and I wondered if it had always been so. The Westminister Mall was built in the 1970s, so it seems the bank always related to its neighboring properties as it does today; perhaps once the streets were not one-way, when the freeway was less crowded, but this Home Savings location was clearly aimed at mall patrons, much as the Pomona location anchored one end of the downtown pedestrian mall. 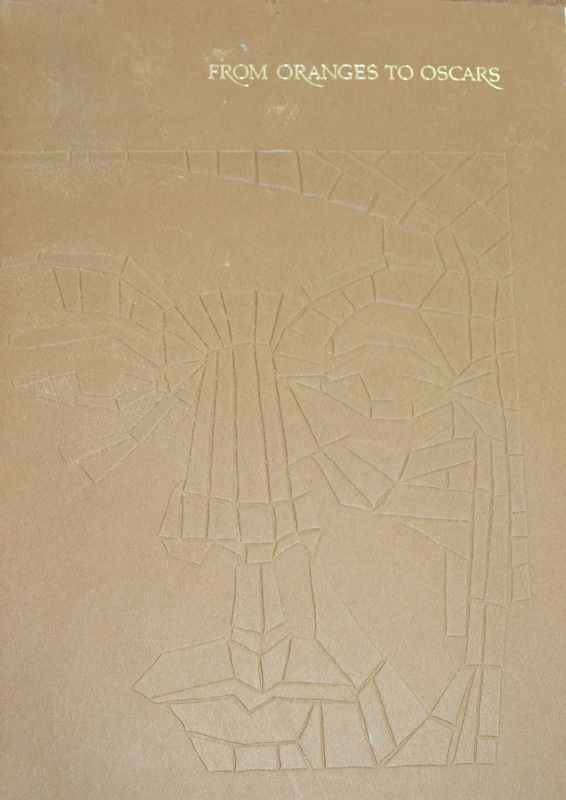 This artwork–especially, by the 1970s, when it would have been instantly recognizable to southern Californians–clearly serves in part as a billboard here; the dimensions are about the same, and the combination of the setback and the roadways suggest it was intended to be seen from the car, not admired by passersby. Indeed, the mall seems essential to the identity of Westminster, California — so much so that Westminster city officials have a satellite office, City Hall at the Mall, to cater to their constituents. So while the bank does not have the approachability of, say, the Sunset and Vine location, it still serves an iconic function, saluting all those that enter the mall, the heart of this community. *I am trying to provide a new and more comprehensive list/map/timeline of the Home Savings bank art, characterizing some as “historical” along with other themes. I have had a chance to interview some of the architects involved with siting and designing the Sheets Studio work; I am also in touch with those who installed, fabricated, and restored the works, and I am trying to keep abreast of the preservation challenges. So, keep posted, and keep in touch with any leads! Now that we have taken a tour of all the various media used by the Millard Sheets Studio, I will focus in on the images and juxtapositions that first drew this historian of nineteenth-century North America to this project about post-World War II Southern California. 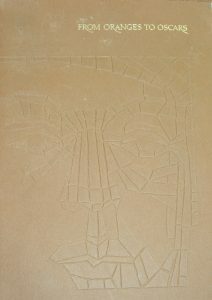 Before I learned that there were so many, and so varied, artworks in the Home Savings banks, my mind fixated on the history images, in grand, prominent locations, like the parade of figures at Garnet in San Diego, the collection at Sunset and Vine, or this mosaic, commanding an entrance to the San Fernando Valley in Studio City. In four figures, this Sheets Studio mosaic tells one story of California history, expanding on the history of “From Oranges to Oscars” discussed last week. The Franciscan friars came to Christianize California’s Indians; California’s frontier was a place of vaqueros, ranching and cowboying according to Spanish and Mexican traditions before the coming of American control; the gold rush changed everything; and, in this rendition — presto! California was ready for the magical transformations of Hollywood moviemaking. Clearly, a lot is missing from such a history. But I would rather focus on what draws these four scenes together, and how they might have been chosen to tell their story together, on the bank facade, in giant figures. First, these are clearly picturesque moments in California history, moments long remembered for their adventure or intrigue or possibilities. As I have noted, there is an attempt to tell happy, uncomplicated stories — no Okies arriving out of the Dust Bowl, no Zoot Suit riots, not even the proud shipbuilding of Californians during World War II. We academics now have a greater sense of the displacement caused by the Missions and the gold rush, but they remain storied moments in the public’s perception of California history. And perhaps their rootedness, their long histories, was intended to rub off on the new movie business, and the new bank in the still-newly-suburbanizing San Fernando Valley. Are the images about history, or about movies? Given the gaps and the connection to nostalgia, it can be hard to distinguish the two. The camera does point left, taking in the dramatically dressed woman but also, perhaps, the character drama of a Franciscan friar, a vaquero, or a prospector, each a common figure in the radio dramas, films, and television shows of the twentieth century. One formal question to ponder, too: Why the tricolor background? Merely to highlight the colors, and give a chance to add depth to the figures? Or something about the amounts of marble needed for such a large space? One more thing to research, I suppose. The Millard Sheets Studio could create the fantastic art of these banks because they had the financial backing of the Home Savings banks, to create these ornate and expensive pieces of artwork. Hence, as much as Sheets, Denis O’Connor, and Susan Hertel can be credited for these gifts to California, the financial muscle and some of the visionary designs should be attributed to Howard Ahmanson. This image of Ahmanson and the Hollywood stars he wished to honor at Sunset and Vine comes from a brochure that Home Savings produced to celebrate the bank’s opening, titled “From Oranges to Oscars.” Once again, the whistle-stop tour of California history is on display; more about that another time. Could the artwork be intended merely as a thank you? Or would the promise of increased attention and free publicity for a grand opening lead to more deposits and hence profits? Did actors and movie professionals generally like banking at a place decorated by the images of their craft? 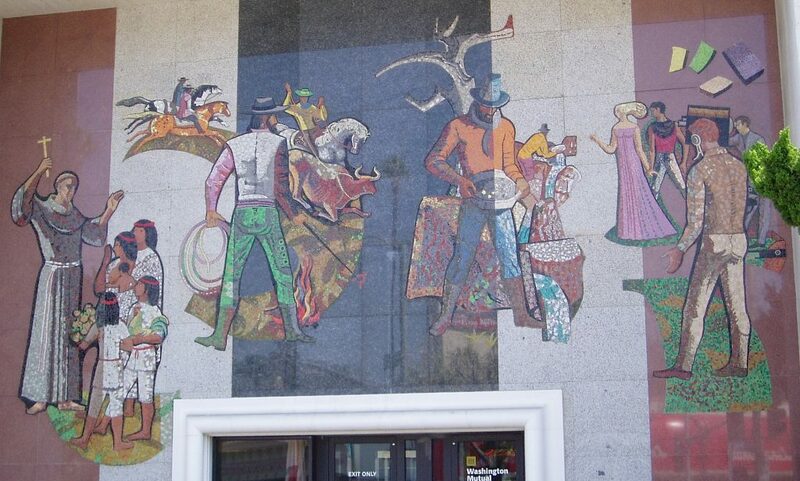 Did anyone dislike these mosaics — not for artistic choices, but for something about the mere idea of public art upon a bank? Not to seek out cynicism and discord — even as an academic, we can believe in happy stories — but I do hope to learn more about the economics, the cultural choices, and more that went into creating these images. 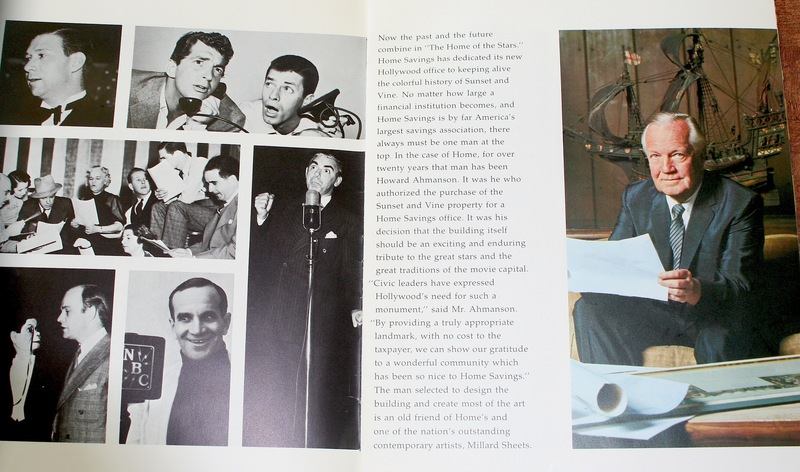 I don’t think there was a tax break awaiting the creation of beautiful, rather than merely functional, bank spaces, so I do hope to learn more about the motivations, for Sheets, his studio, and their first Home Savings patron, Howard Ahmanson Sr.